The Holy Grail of musical theatre is coming! 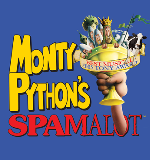 BrassNeck announce the staging of the Tony Award winning Monty Python musical Spamalot, to be performed in Leeds in November 2016. BrassNeck Social Presents MINUTE TO WIN IT! Please complete the details below and we will add you to our mailing list.